Maria is an Executive with over 30 years of experience in commercial and retail banking. Nationally recognized as an engaging leader, Maria is featured in several books and publications including How Women Lead by Dr. Sharon Hadary, and Off the Sidelines by Senator Kirsten Gillibrand. She is currently the President and CEO of the Cornerstone Fund, a church extension fund affiliated with the United Church of Christ. She has also worked with several “fintech” companies providing strategic consulting. While at KeyCorp from 2001 to 2015 she served as an Executive Vice President and a member of KeyCorp’s Executive Council. She was the founder of the Key4 Women program and also held leadership positions in Consumer Banking, Business Banking, Strategic Planning, and Client Experience. She was named twice (in 2013 and 2014) as one of American Banker’s “25 Most Powerful Women in Banking”, and twice as one of the “Women to Watch” (2011 and 2012). Prior to Key, she spent three years at the Greater Cleveland Growth Association and over 10 years at Bank One Cleveland, serving in various management capacities before becoming Director of Marketing. She is a prominent thought leader on small business and women’s leadership and has been featured frequently in media including the Wall Street Journal, CNN, NPR, Bloomberg News, and BusinessWeek. 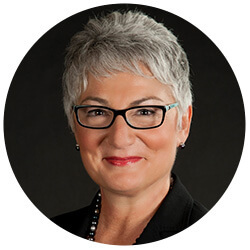 As a senior consultant at the telos institute, Maria provides executive coaching and consulting services related to leadership development, change management and implementation of transformative initiatives. Maria’s coaching philosophy focuses on bringing out the best and most unique leadership traits of every individual she coaches. She is particularly skilled at helping leaders develop and adapt their style to enhance their effectiveness in any setting. Maria is a graduate of the University of Notre Dame with a Bachelors of Business Administration in Finance. She also completed the Key Executive Experience at the Case Weatherhead School of Management. Maria is a proud native of Cleveland, Ohio where she and her husband raised their children. Together they enjoy travel and learning about other cultures. Maria is an avid rower and enjoys outdoor activities.